(MP033). Frank Watson Wood (1862-1953). 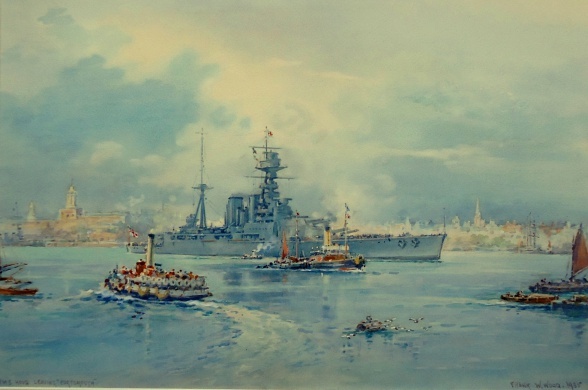 Watercolour signed and dated 1935 and annotated "HMS HOOD leaving Portsmouth.". Standard size: 20x 14 (51 x 36cms) approx. Built on the banks of Scotland’s River Clyde, the great 860 foot long hull - already weighing some 21,000 tons - was launched on 22 August 1918 by Lady Hood, widow of Rear Admiral the Hon Horace Hood CB MVO DSO who had lost his life two years earlier when flying his flag in the battle cruiser INVINCIBLE at Jutland. It was one of his ancestors, Viscount Samuel Hood, whose brilliant actions against the French in the West Indies at the end of the eighteenth century had become legendary. Other Hoods from this family had also brought lustre to the annals of the Royal N and so it had been decided that the name of the new ship should honour this family of great sailors: and their motto, Ventis Secundis, and crest of 'a Cornish chough sable in front of an anchor in bend sinister’ were adopted too. Not commissioned until some eighteen months after the Great War armistice, HOOD had been too late to play any part in the Great War and would be old by the time the Second World war broke out. Yet by a combination of sheer size and power allied with her undeniable beauty of line and symmetry of shape she nevertheless became the best known warship of her time across the oceans of the world and played a not insignificant part in the international politics of the next twenty years. She represented not only destructive power on a grand scale but also security for those who pass on the seas upon their lawful occasions and by the time of this painting she was well into middle age. But with her stunning looks still intact, her size, speed and armament unsurpassed, the world-famous HOOD had never been available, could never be spared it seemed for a much needed modernisation because she was always in demand at sea. In May 1935 when this watercolour was painted, HOOD was the flagship of the Rear Admiral Commanding the Battle Cruiser Squadron, Rear Admiral Sidney Bailey CB CBE DSO, and her Flag Captain was Captain F J B Tower OBE who had been the ship's first gunnery officer; Commander Rory O'Conor, author of "Running a Big Ship on the Ten Commandments" (written about his time in HOOD) was the Flag Commander. The battle cruiser had connected tugs and slipped from North Slip Jetty at 0900 that morning and after turning and then slipping the tugs at 0919 she had rung on revolutions for 10 knots for the passage down harbour: we see her here shortly after 0920 and the buoy in the right foreground shows the last of the flood tide is still making. Always a crowd puller around the world, always the centre of attention, the huge, symmetrically proportioned battle cruiser with a "terrible beauty and mailed might that both appals and exalts" is giving the passengers on the Gosport ferry the treat of their lives as she glides slowly towards the narrow, crowd lined entrance of Portsmouth harbour. Stirring music from the Royal Marine band drawn up on the quarterdeck is adding to the occasion and above and behind HOOD’s ensign can be seen the mellifluous old red brick of Semaphore Tower, the Rigging House and the Sail Loft of the dockyard. Her log states that by 1205 she was south west of Nab Tower off the eastern end of the Isle of Wight and thirty five minutes later, when south of the Island and with sufficient water under her four propellors for speed, she had started to work up for a full power trial. It seems that on this occasion she achieved a little over 28 knots - not her best showing by any means! Her navigating officer, Commander E V Lees, noted that she had burned 36.5 tons of oil fuel per hour during that two hour trial a fact that was recorded at the front of her Ship's Log where, as required by a parsimonious Treasury, it was necessary to specify all occasions when economical speed was exceeded. That night HOOD anchored in the naval base of Portland, Dorset and the next day, in company with some 16 other ships of the Home Fleet, she sailed for Southend at the mouth of the River Thames. There, together with HMS NELSON (wearing the flag of the Commander-in-Chief Home Fleet, Admiral the Earl of Cork & Orrery GCB), and RODNEY, VALIANT, RENOWN, COURAGEOUS, FURIOUS, ORION, LEANDER, ACHILLES, NEPTUNE, FAME, KEMPENFELT, FEARLESS, FORRESTER and submarines L21 and L53 she had participated in the preliminary celebrations marking the Silver Jubilee of King George V.